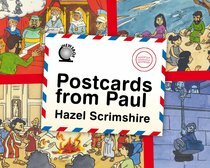 Postcards from Paul is the ideal way to teach children about the journeys and teaching of Paul as he made his way church planting and visiting churches that sprang up after Christians moved across the world in response to Jesus' command to go into all the world. The cartoon artwork has been freshly scanned and the book has a bigger page size. A former editor of children? 's books and has been a youth worker at St Paul? 's and St George s, Edinburgh, Hazel is now married and lives in Bradford, UK.